For example the Session Bean interface defines ejbRemove, ejbPassivate (stored to secondary storage), and ejbActivate (restored from passive state). You don't get to control when these methods are called, just what they do. The container calls us, we don't call it. I think, the point of view that DI is IOC, means the dependency of an object is inverted: instead it controls its own dependencies, life cycle... something else does it for you. But, as you told me about DI by hands, DI is not necessarily IOC. We can still have DI and no IOC. However, in this paper (from the pococapsule, another IOC Framework for C/C++), it suggests that because of IOC and DI, the IOC containers and DI frameworks are far more superior to J2EE, since J2EE mixes the framework code into the components, thus not making it Plain Old Java/C++ Object (POJO/POCO). My Question: What exactly is IOC and DI? I am confused. Based on pococapsule, IOC is something more significant than just invert the control between objects or programmers and frameworks. DI is a form of IoC, where implementations are passed into an object through constructors/setters/service lookups, which the object will 'depend' on in order to behave correctly. DI Frameworks are designed to make use of DI and can define interfaces (or Annotations in Java) to make it easy to pass in the implementations. IoC Containers are DI frameworks that can work outside of the programming language. In some you can configure which implementations to use in metadata files (e.g. XML) which are less invasive. With some you can do IoC that would normally be impossible like inject an implementation at pointcuts. See also this Martin Fowler's article. Before DI had a name, people started to refer to frameworks that manage Dependencies as Inversion of Control Containers, and soon, the meaning of IoC gradually drifted towards that particular meaning: Inversion of Control over Dependencies. IoC means that objects do not create other objects on which they rely to do their work. Instead, they get the objects that they need from an outside service (for example, xml file or single app service). 2 implementations of IoC, I use, are DI and ServiceLocator. DI means the IoC principle of getting dependent object is done without using concrete objects but abstractions (interfaces). This makes all components chain testable, cause higher level component doesn't depend on lower level component, only from the interface. Mocks implement these interfaces. Here are some other techniques to achieve IoC. 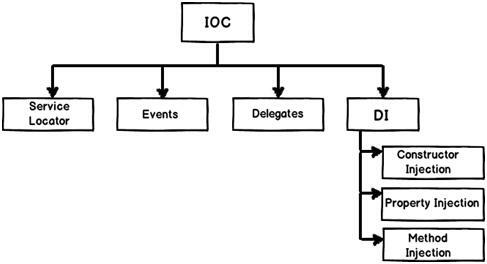 IoC (Inversion of Control) :- It’s a generic term and implemented in several ways (events, delegates etc). DI (Dependency Injection) :- DI is a sub-type of IoC and is implemented by constructor injection, setter injection or Interface injection. Constructor-based DI is realized by invoking a constructor with a number of arguments, each representing a collaborator.Using this we can validate that the injected beans are not null and fail fast(fail on compile time and not on run-time), so while starting application itself we get NullPointerException: bean does not exist. Constructor injection is Best practice to inject dependencies. IOC (Inversion Of Controller): Giving control to the container to get an instance of the object is called Inversion of Control., means instead of you are creating an object using the new operator, let the container do that for you. DI (Dependency Injection): Way of injecting properties to an object is called Dependency injection. Spring will support only Constructor Injection and Setter/Getter Injection. -) Suppose On development environment, you want to save SMSs sent to a text file instead of using SMS gateway, to achieve this; we will end up changing the concrete implementation of (SMSService) with another implementation, we are losing flexibility and forced to rewrite the code in this case. -) We’ll end up mixing responsibilities of classes, our (UIHandler) should never know about the concrete implementation of (SMSService), this should be done outside the classes using “Interfaces”. When this is implemented, it will give us the ability to change the behavior of the system by swapping the (SMSService) used with another mock service which implements the same interface, this service will save SMSs to a text file instead of sending to mobileNumber. We have achieved a lot of flexibility and implemented separation of concerns in our code, but still we need to do a change on the code base to switch between the two SMS Services. So we need to implement Dependency Injection. Now the UI form which will talk with class (UIHandler) is responsible to pass which implementation of interface (ISMSService) to consume. This means we have inverted the control, the (UIHandler) is no longer responsible to decide which implementation to use, the calling code does. We have implemented the Inversion of Control principle which DI is one type of it. But the spring documentation says they are same. In the first line "IoC is also known as dependency injection (DI)". IoC - Inversion of control is generic term, independent of language, it is actually not create the objects but describe in which fashion object is being created. DI - Dependency Injection is concrete term, in which we provide dependencies of the object at run time by using different injection techniques viz. Setter Injection, Constructor Injection or by Interface Injection. Inversion of control is a design paradigm with the goal of giving more control to the targeted components of your application, the ones getting the work done. Dependency injection is a pattern used to create instances of objects that other objects rely on without knowing at compile time which class will be used to provide that functionality. IOC indicates that an external classes managing the classes of an application,and external classes means a container manages the dependency between class of application. basic concept of IOC is that programmer don't need to create your objects but describe how they should be created. The main tasks performed by IoC container are: to instantiate the application class. to configure the object. to assemble the dependencies between the objects. DI is the process of providing the dependencies of an object at run time by using setter injection or constructor injection. IOC (Inversion of Control) is basically design pattern concept of removing dependencies and decoupling them to making the flow non-linear , and let the container / or another entity manage the provisioning of dependencies. It actually follow Hollywood principal “Don’t call us we will call you”. So summarizing the differences. Inversion of control :- It’s a generic term to decouple the dependencies and delegate their provisioning , and this can be implemented in several ways (events, delegates etc). The following article describe this very neatly. Inversion of Control is a generic design principle of software architecture that assists in creating reusable, modular software frameworks that are easy to maintain. It is a design principle in which the Flow of Control is "received" from the generic-written library or reusable code. To understand it better, lets see how we used to code in our earlier days of coding. In procedural/traditional languages, the business logic generally controls the flow of the application and "Calls" the generic or reusable code/functions. For example, in a simple Console application, my flow of control is controlled by my program's instructions, that may include the calls to some general reusable functions. In Contrast, with IoC, the Frameworks are the reusable code that "Calls" the business logic. For example, in a windows based system, a framework will already be available to create UI elements like buttons, menus, windows and dialog boxes. When I write the business logic of my application, it would be framework's events that will call my business logic code (when an event is fired) and NOT the opposite. Although, the framework's code is not aware of my business logic, it will still know how to call my code. This is achieved using events/delegates, callbacks etc. Here the Control of flow is "Inverted". So, instead of depending the flow of control on statically bound objects, the flow depends upon the overall object graph and the relations between different objects. Dependency Injection is a design pattern that implements IoC principle for resolving dependencies of objects. In simpler words, when you are trying to write code, you will be creating and using different classes. One class (Class A) may use other classes (Class B and/or D). So, Class B and D are dependencies of class A. A simple analogy will be a class Car. A car might depend on other classes like Engine, Tyres and more. Dependency Injection suggests that instead of the Dependent classes (Class Car here) creating its dependencies (Class Engine and class Tyre), class should be injected with the concrete instance of the dependency. At first sight, all looks rosy. The user will write some text. The developer will capture the text and call the CheckSpellings function and will find a list of Typos that he will show to the User. Everything seems to work great until one fine day when one user starts writing French in the Editor. To provide the support for more languages, we need to have more SpellCheckers. Probably French, German, Spanish etc. Here, we have created a tightly-coupled code with "English"SpellChecker being tightly coupled with our TextEditor class, which means our TextEditor class is dependent on the EnglishSpellChecker or in other words EnglishSpellCheker is the dependency for TextEditor. We need to remove this dependency. Further, Our Text Editor needs a way to hold the concrete reference of any Spell Checker based on developer's discretion at run time. In our example, the TextEditor class should receive the concrete instance of ISpellChecker type. Now, the dependency can be injected in Constructor, a Public Property or a method. So that the calling code, while creating the text editor can inject the appropriate SpellChecker Type to the instance of the TextEditor. DI and IOC are two design pattern that mainly focusing on providing loose coupling between components, or simply a way in which we decouple the conventional dependency relationships between object so that the objects are not tight to each other. With following examples, I am trying to explain both these concepts. The above process of giving the control to some other (for example the container) for the instantiation and injection can be termed as Inversion of Control and the process in which the IOC container inject the dependency for us can be termed as dependency injection. The two concepts work together providing us with a way to write much more flexible, reusable, and encapsulated code, which make them as important concepts in designing object-oriented solutions. IOC(Inversion Of Control): Giving control to the container to get instance of object is called Inversion of Control. It means instead of you are creating object using new operator, let the container do that for you. DI(Dependency Injection): Passing the required parameters(properties) from XML to an object(in POJO CLASS) is called Dependency injection. The DIP is all about isolating your classes from concrete implementations and having them depend on abstract classes or interfaces. It promotes the mantra of coding to an interface rather than an implementation, which increases flexibility within a system by ensuring you are not tightly coupled to one implementation. Closely linked to the DIP are the DI principle and the IoC principle. DI is the act of supplying a low level or dependent class via a constructor, method, or property. Used in conjunction with DI, these dependent classes can be inverted to interfaces or abstract classes that will lead to loosely coupled systems that are highly testable and easy to change. In IoC, a system’s flow of control is inverted compared to procedural programming. An example of this is an IoC container, whose purpose is to inject services into client code without having the client code specifying the concrete implementation. The control in this instance that is being inverted is the act of the client obtaining the service. Millett,C (2010). Professional ASP.NET Design Patterns. Wiley Publishing. 7-8. //Now control is shifted to Spring. Container find the object and provide it. Overall the control is inverted from old concept of coupled code to the frameworks like Spring which makes the object available. So that's IOC as far as I know and Dependency injection as you know when we inject the dependent object into another object using Constructor or setters . Inject basically means passing it as an argument. In spring we have XML & annotation based configuration where we define bean object and pass the dependent object with Constructor or setter injection style. “IoC is when you have someone else create objects for you.” So instead of writing "new " keyword (For example, MyCode c=new MyCode())in your code, the object is created by someone else. This ‘someone else’ is normally referred to as an IoC container. It means we handover the rrsponsibility (control )to the container to get instance of object is called Inversion of Control., means instead of you are creating object using new operator, let the container do that for you. 1) DI is Child->obj depends on parent-obj. The verb depends is important. 2) IOC is Child->obj perform under a platform. where platform could be school, college, dance class. Here perform is an activity with different implication under any platform provider. As for this question, I'd say the wiki has already provided detailed and easy-understanding explanations. I will just quote the most significant here. dependency injection is a technique whereby one object (or static method) supplies the dependencies of another object. A dependency is an object that can be used (a service). An injection is the passing of a dependency to a dependent object (a client) that would use it. Not the answer you're looking for? Browse other questions tagged dependency-injection inversion-of-control or ask your own question. What does mean Inversion of Control and Dependency Injection in Spring Framework? and what is difference ? Why in the Spring framework? How can I make an object know what container it is in? What is wrong in my way of explainning DI and IoC? How are domain events dispatched from within domain objects?